You might say King Philip's War began with the fateful decision of a handful of English settlers and wary New World natives to ally with one another. As long as both sides recognized that they needed each other, there was peace. The next generation, however, came to see things differently. King Philip's War is the least well known of all American conflicts and yet, per capita, it was the deadliest and most expensive. 1200 homes were burned and vast stores of food were destroyed. The economic devastation forced England to tighten colonial control leading to later political friction with the colonies. Countless Indian villages were burned and nearly 6000 Indians were slain or captured and sold into slavery. Native relations were never the same again. 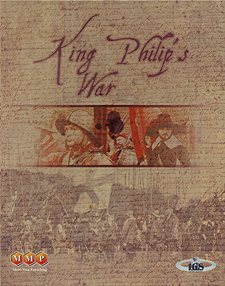 King Philip's War is a low-complexity game in which the Indian player creates a loose confederation of tribes in hopes of defeating Colonial English forces. The English player raises military units in Massachusetts, Connecticut, Rhode Island and what was then the separate colony of Plymouth to carry the fight into the tribal lands of his opponent. Two separate games are included, a five turn game that can be played in under 90 minutes and a longer nine turn game that can be played in under three hours. In both scenarios, the fearless sachems Philip and Canonchet vie for New England supremacy and ultimately for survival against the likes of fighting Governor Josiah Winslow and Benjamin Church, the reputed founder of the US Army Rangers. The game offers a beautifully rendered map of New England, player aids, and tokens representing war bands, colonial companies, forts, leaders, guides, spies and raided regions, and a unique combat event die that introduces fog of war every turn. The players must contend with all the facets of the actual campaign to lead their forces to final victory.